TORONTO, ONTARIO – June 13, 2017 – Toyota Canada Inc. today announced partnerships with four of Canada’s most respected National Sports Organizations. 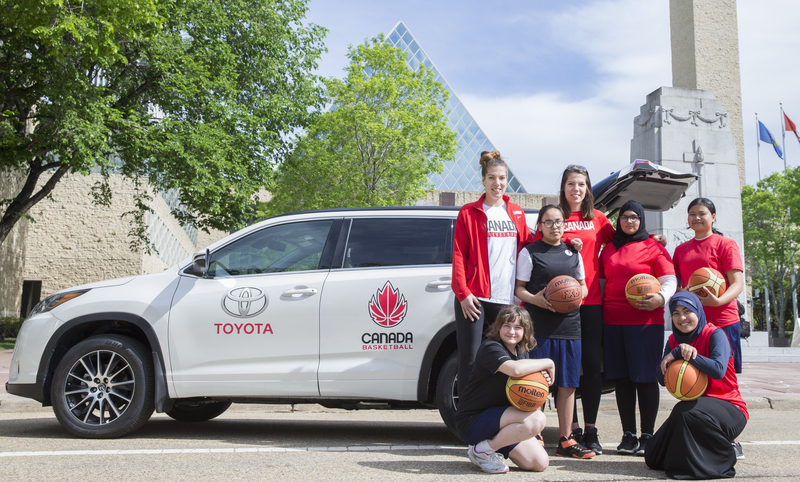 Toyota Canada will be the Official Mobility Sponsor and Official Vehicle of Canada Basketball, Canada Soccer, Freestyle Canada, and Wheelchair Basketball Canada. Through these four new partnerships, Toyota is hoping to help encourage and enable more Canadians to experience the joy and excitement of participation in sport. As a sponsor, the company will support elite level athletes and national teams, as well as the development of various grassroots sports initiatives. As Official Mobility Sponsor and Official Vehicle of Canada Basketball, Toyota Canada will encourage and celebrate the next generation of basketball talent in Canada. Toyota will also Sponsor all eight of the Canadian National Teams, including the Senior Men’s and Women’s teams, as well as the development, U-16/U-17 and U-18/U-19 age-groups. “Toyota’s sponsorship will help us continue to foster the growth and development of basketball across the country – from grassroots programming to our national teams,” said Michele O’Keefe, President & CEO, Canada Basketball. “These types of partnerships enable us to take our organization from good to great through increased awareness of the game, enhanced program delivery, and continued investment in podium performances. Toyota Canada will also be supporting an important part of our country’s deep Winter sports heritage as a Tier 1 Partner of Freestyle Canada. As the Official Mobility Sponsor and Official Vehicle of Freestyle Canada, Toyota will contribute to the execution of the organization’s domestically hosted international competitions as Presenting Sponsor of the FIS Freestyle Ski World Cup events in Quebec and Alberta. The partnership also supports future generations of freestyle skiing athletes with Title Sponsorship of the Canadian National Championship events and World Cup Community Days. Canada Basketball is the National Sporting Organization for the sport of Basketball in Canada. Canada Basketball is respected worldwide and is recognized by the International Amateur Basketball Federation (FIBA) and the Government of Canada as the sole governing body of the sport of amateur basketball in Canada. Canada Basketball, a not-for-profit organization, represents all basketball interests, provides leadership, coordination and direction in all areas of the sport of basketball. For more information, please visit: www.basketball.ca. Since 1981, Freestyle Canada has been developing Olympic and World Champions in the freestyle disciplines of aerials, moguls, halfpipe and slopestyle skiing. With the support of our valued corporate, private and government partners, we will continue to build on our rich history of success, delivering freestyle skiing programs that inspire athletes from all across Canada to harness their courage, go for their dreams and become who they aspire to become. For more information, please visit www.freestylecanada.ski. Wheelchair Basketball Canada is the national sport governing body responsible for the organization of the sport in Canada. It is a non-profit, charitable organization that is committed to excellence in the development, support and promotion of wheelchair basketball programs and services for all Canadians from grassroots to high performance. For more information, please visit www.wheelchairbasketball.ca.